Temperatures soared past the 100 degree mark yesterday, making it the highest in 23 years since July 31, 1988 when it was 105°F. It was HOT! Stepping outside was like walking into a wall of hot air. It hit you right there and then and there was no escaping the heat. Good thing it only lasted a day and we are now back to the pleasant 70’s. Temperatures will continue to drop to the 60’s this weekend before climbing up again. It is like a roller coaster ride, swinging wildly up and down. My poor irises did not stand a chance against the high temperature and dry winds. The buckets of water I poured on them did not help. It was sad. I had to cut and bring them indoors this morning. I managed to resuscitate some and they are now standing tall again in the sunroom. On such warm days, light and clear soups are a great accompaniment to a rice based meal. Clear soups quenches the thirst and clears the palate. Often times, a little soup is added to the rice to moisten it. In fact, rice in soup is the first food for many East Asian kids. Lotus root is the root of the lotus plant and is found underwater. It grows in segments and each segment has hollow tubes running through it. When sliced cross-wise into discs, it is reminiscent of telephone dials. Depending on the variety, it can have a light to reddish brown peel with a creamy colored flesh. The flavor is mildly sweet and the texture varies from crunchy to starchy. The thinner and lighter colored roots are crunchy while the thicker and darker colored roots tend to be starchy. Lotus root is a favorite ingredient in Chinese soups but it can also be used in stir-fries. There are two main categories of Chinese soups. The quick boil soup may involve a little sauteing before prepared stock is poured in. Thin slices of meat and vegetables are added to the stock and lightly cooked. Simmered soups take a longer time to prepare. All ingredients are dumped into a large pot and simmered until the flavors meld together and infuse the soup. Oil is not used and therefore there is no sauteing involved. Double-boiled soups are very similar to simmered soups except that moist heat is used to ensure gentle cooking. This method is used for herbal soups and delicate ingredients like bird’s nests and sharks fins. Rinse and soak peanuts and red dates for 30 minutes. Drain. Peel lotus root with vegetable peeler. 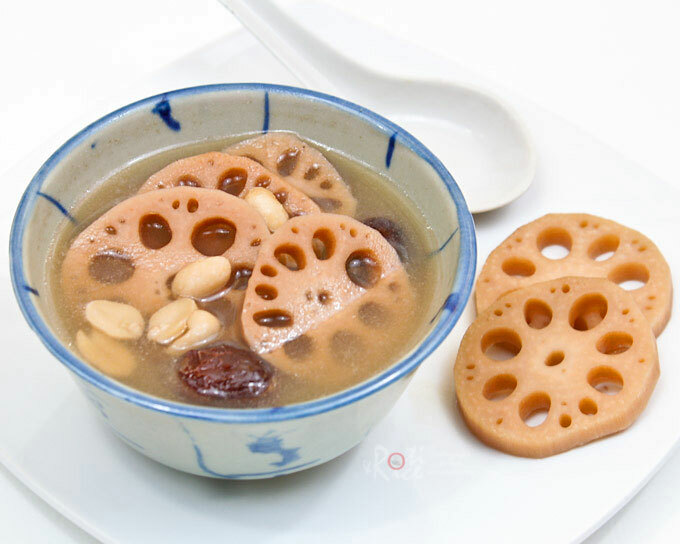 Cut lotus root cross-wise into ¼-inch thick slices. Place all ingredients in a large pot and bring to a boil. Reduce heat to low and allow soup to simmer for 1½ to 2 hours. Skim off scum appearing on the surface. Season with salt. **Pork ribs may be substituted with 2 chicken carcass. Oh no…your poor little plants. Give them more water. I remember having these soup when I was young. They are very comforting for all weathers and occasions. I love all the interesting things you post. 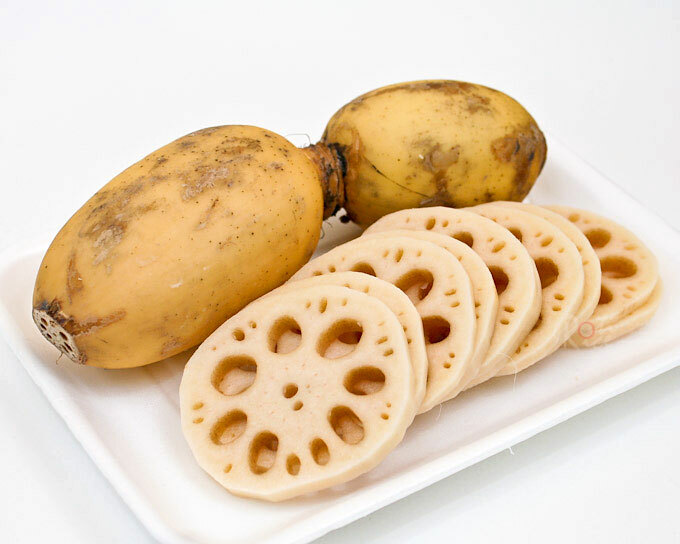 I have not used fresh lotus root before, just packaged in the Asian market. It looks nice in a bento too. I would love to try this soup. I can’t believe how hot your weather was, we have never reached 100 degrees here. I know living on the coast helps with that. So sad to see your poor irises like that. I waited the entire year for those irises and the day they bloom, they fell to the ground! Sad! Hmmm! I like you used pork ribs as broth! 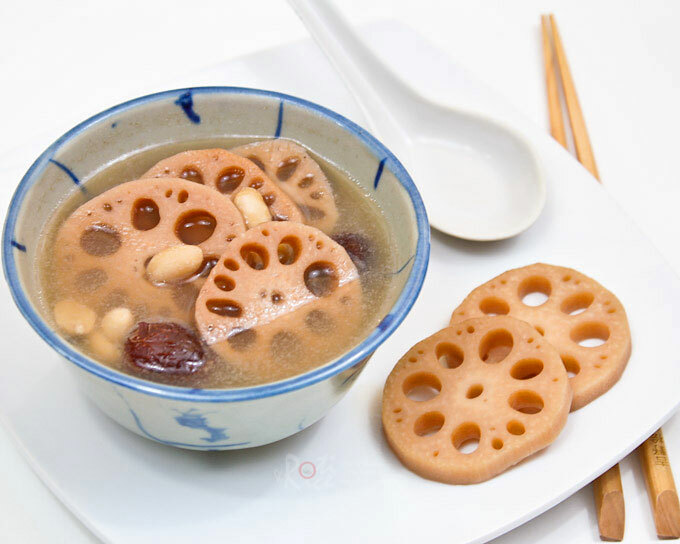 We use lotus root for simmmered or fried food, but soup is a good idea. Stay cool! 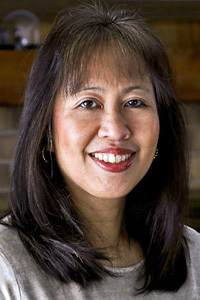 As I read your blog, I realize how little I really know about Asian cuisine. I learn something new every day from your blogs. I have never used (or knowingly eaten) lotus root 🙁 It actually looks so pretty. From your description I imagine that in addition to using it in soups (and yours does look lovely), it could also be roasted. Or is that a wrong assumption? I have never tried roasting lotus root and so I am not sure how it will turn out. It is normally boiled or simmered. Oh no… I can imagine how hot it is… blech … me no like summer!!! We love lotus root soup too. I cook it whenever I can find nice and fresh looking lotus root. Supply for Asian ingredients here in the Midwest can be unpredictable. It is so nice to visit your blog after a very hectic and manic past 4 weeks. I love the Barley Water post very much, and now this soup is just what I would love to have right now. My sort of comfort food…. Welcome back! 🙂 Life is hectic…wish it will slow down a little. Lotus root soup is my favorite and I can just have the soup with a little rice. Are you kidding, Biren! 100 degree! Gosh, I definitely will take off my shirt. haha… Just blaughing. Honestly, 100 degree is way too hot for all of us. I’m glad everything is back to normal again. I bet the soup will helps to chill down a bit. Take care and have a lovely day. Oh, your poor irises!! It is near 100 today…YUCK! HI Biren, This soup is looking absolutely delightful. Loved the new combo of ingredients and the recipe is so nicely made and presented. Saving this recipe of urs and wud love to give ur version a try on the coming weekend. Have a great day….Sonia !!! Love your article Biren. I have noticed seen lotus root in the Asian stores here. I will be more vigilant next time I go into one. We can never win with the weather – it’s either too hot or cold…It’s shame that the heat ruined your flowers. Lotus roots are such beautiful things. I’ve never ventured to cook them. I love this kind of soup. I learned to cook them from my mother-in-law. This is something I would love to try because it has peanuts and the red dates that I like. I would have loved to have a bowl of your soup. Lotus root is one ingredient I’m waiting to try. Lotus root is all new to me, Biren! Haven’t tried it nor do I remember seeing it before…but your soup really looks and sounds good! I’m glad to find another ingredient to try…thanks to you! This is the second lotus root soup I’ve seen today! Now I’m craving for a bowl! I cooked with lotus root once and i didn’t like it. well, that’s because i cooked it a wrong way hahaha. this soup sounds good with savory flavor! Hey Tanantha, good to see you here again. 🙂 I’ve missed you. 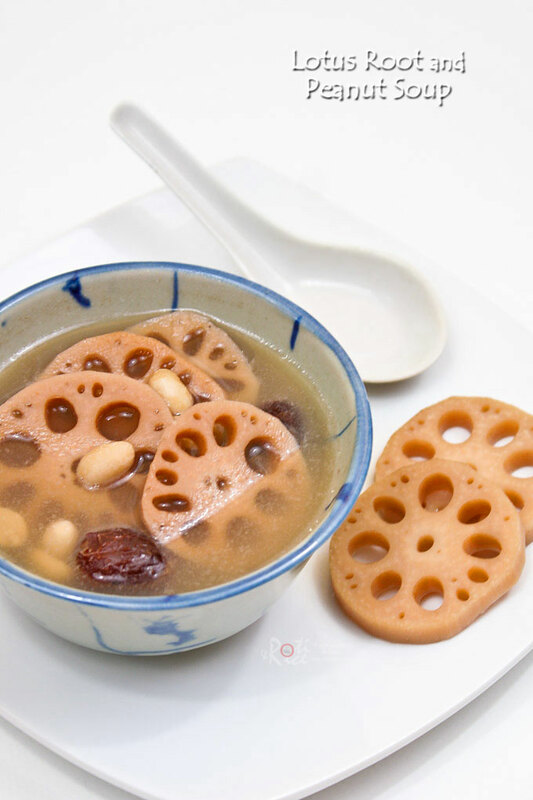 Lotus root is best cooked in a soup, simmered, or stir-fried. Do give it another try. Biren dear, I have some awards for you. Please feel free to hop over to collect it. Your poor Irises – that day was something. I watered my plants three times to keep them going – and the winds – horrendous. I love how you fashionmed a succulent, delectable soup out of that day. It looks so refreshing. Where did you get the lotus root? 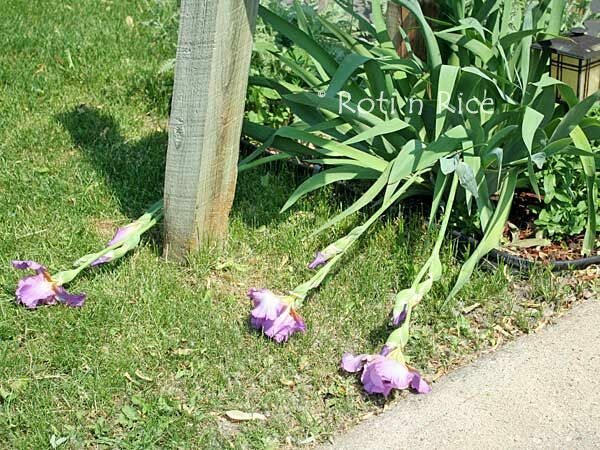 Oh yes…the winds were so strong and dry that day, the irises didn’t stand a chance. I bought the lotus root at the Shanghai Market in Hopkins. I have never had lotus root before. It looks so interesting and pretty! Great soup! This is such an interesting post! I have to admit that I do not know Chinese cuisine very well… so this was really informative for me. The lotus root looks so beautiful! I am sure this soup is amazing! Wow! Your poor flowers – what a sad picture! At least the soup looks happy. I’ve never seen lotus root. I love visiting your blog. I always learn something new. I hope it cools off for you, and warms up for us here in Seattle. Maybe we could share the heat! Your poor irises! At least you were able to revive them inside the house :o) I love lotus root and porky broth…it all looks so yummy! I have never cooked or eaten lotus root. I had no idea it is actually edible. Oops. My plants suffered too…. But now it seems they are doing quite well….